Our beginning started about a mile out of town as a Co-op with 18 vendors. Our business was just taking off when The Samuel Aurand House became available. Upon deciding to move we downsized to less vendors that provide quality unique antiques and collectibles. Now located in the center of the small sleepy old German town of New Berlin you will find a treasure trove of antiques & country crafts. Located in The Samuel Aurand House B&B, which began in 1838 as a public house & tavern you will find our Co-op filled with an abundant variety of vintage & unique antiques, crafts and collectibles. The Emporium is a one stop shopping place for all your design and decorating needs. Our store has a variety of antiques and country crafts. We offer candles both traditional and battery, baskets of any shape and size as well as greeting cards by “Leanin Tree”. 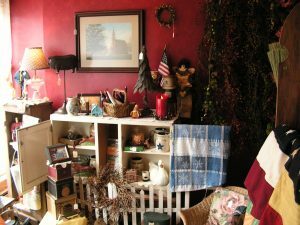 The antique side of the store has unique items both local to the area and from other parts of the state. The Clock Guy is out newest vendor who brings his many clocks (100 years & older) as well as his ability to repair them. The rear of our shoppe is home to our year round Christmas Shoppe. There you will find hundreds of ornaments, Santa’s, snowmen, trees, garlands and decorative items to fill your home for the holidays. Handmade chalkware for all occasions as well as many homemade Christmas decorations can be found as well. We offer a small line of antique and reproduction furniture and local history books. The Emporium currently has no classes scheduled. The Emporium has monthly specials and events. You can find them listed here as well our holiday events and celebrations. We welcome everyone to come to our Spring Open House! April 12, 13, & 14Th. our shoppe will open with many discounts. There will be refreshments & door prizes as well as many Easter items to fill any home. The winter is finally over and the feel of Spring is in the air so stop in…shop….and enjoy the sights and scents of this renewing time of the year.